My Museum is designed to create hands-on opportunities for personal and intrapersonal expression and exploration. 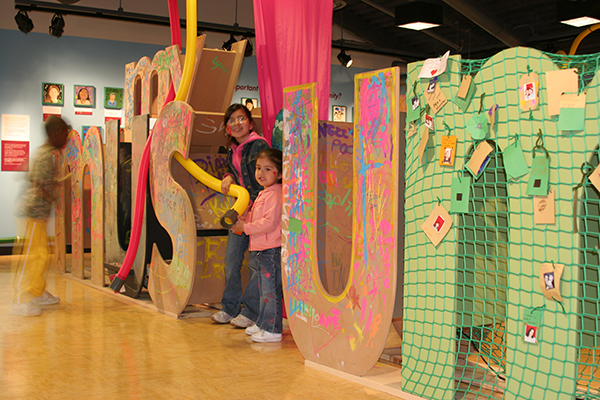 The body-scaled, three-dimensional entry letters entice visitors into a previously underutilized exhibit hall. Spelling out “My Museum” in very varied ways using tactile and diverse materials, these letters represent playful and creative ways to communicate. The exhibit environment is intentionally left unfinished and changeable, so that visitors not only interact, but also create the space around them. 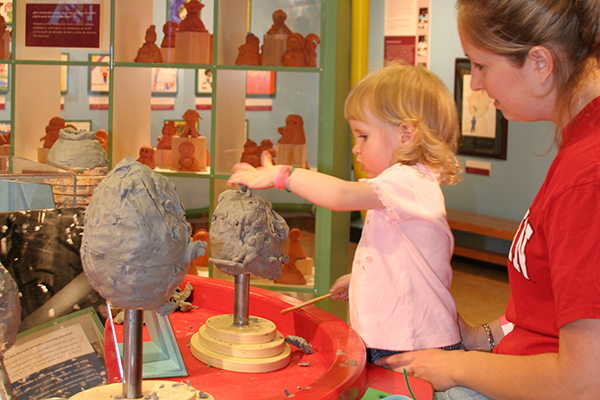 Children engage in art-making using both traditional and innovative materials. At the letters, for example, children chalk on the “u”, tack sticky notes up on the “m”, and walk right through the “e” linen portal. Each letter provides either storage or creative surface on which artwork, messages, and more are applied. The museum letters become an ever-changing landscape. 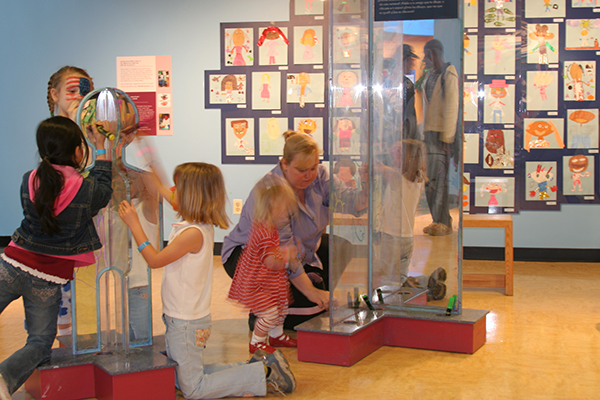 Nearby art-making stations include a clay bust interactive where children work side-by-side exploring their own likeness and a Plexiglas-interactive where visitors paint each other on full-size child-cutouts. Kaleidoscope for Kids is a tubular mini-environment lined with mirrors for the youngest of artists. Kids chalk a caption for their self-portrait and then insert a portrait into the neighborhood mural. 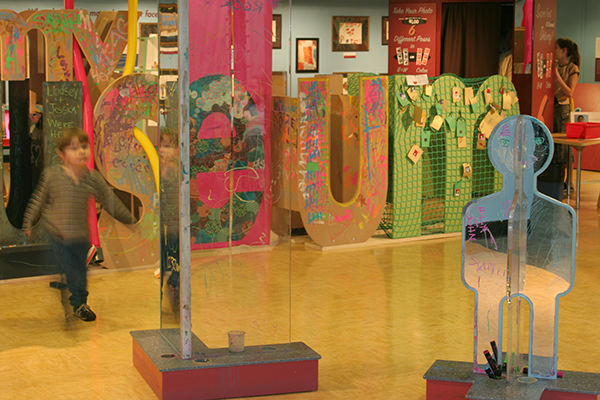 Located just behind the museum letters is a display of children’s art, collaborative art-making experiences, and community outreach artwork.